Series supporting Primary Art and Design. In a clip filmed in 1957, LS Lowry describes his unique way of painting. Browse content similar to Art History. Check below for episodes and series from the same categories and more! and lived here for 43 years. he set to work transforming the grounds. he was composing the subject matter for many of his paintings. it's just like stepping into one of Monet's paintings. famous paintings - Waterlily Pond, one of my favourites. I'll try to capture it in a Monet-style painting of my own. I'm doing a rough sketch to work out my basic composition. and concentrated on light and colour, rather than precise outline. You can get the same effect by half-closing your eyes. I won't squint through my painting - not very practical! I've got something to look through - an old plastic folder. so I can concentrate on the light and colour. Another Impressionist technique is to use thick brush strokes. Up close, they don't look much, but from a distance, look superb. you'd HAVE to view them from a distance. To create my Impressionist painting, I'm not using brushes. I'm going to start with a nice light green for the willow. but acrylics give the same effect and dry a lot quicker. or 33 degrees, like today. I feel a little like the Great Master himself. This is a film about a man who became an artist because he missed a train. and started to walk up the road wondering what to do. which lay at the foot of an immense mill. As he took in the scene, he was filled with the urge to paint it. And at that moment, he decided to become an artist. painting a world in which other people could see no beauty? I really don't know why I paint these streets. I just paint them, that's all, as far as I can see. There's something about them that attracts me in a pictorial sense. are pictures done entirely from... call it imagination if you like. and prefer to paint from the mind's eye. Often I haven't the slightest idea what I'm going to put on the canvas. and, in a strange sort of a way, it seems to come. I work like that until the canvas is completely filled. well...let them do it. I don't mind at all. and they're full of figures and detail. It all takes balancing, which is not easy to do. and you can do no more with the picture. When you're satisfied with that, you leave it as complete. just as he left it almost 100 years ago. 'using what's normally a very mundane subject - the still life. to show how superbly realistically and perfectly they could paint. But Cezanne wasn't interested in that at all. He wasn't interested in a photographic likeness. and then putting them onto his canvas. in what's a fairly pleasing shape for me, I think. the way traditional artists saw perspective. he would tilt it up so he could see that sort of a view of it. move that back here and sit the basket up there. 'sometimes using coins to tilt things by just the right amount. 'he had to use artificial fruit to stop the real fruit from rotting. 'unlike his fidgety portrait sitters. by different colours, rather than by different tones. but he ignored all that sort of perspective. is completely out of whack. On purpose, of course. I think I've done all I can now. 'to stop him painting a fruit bowl all wonky if he wanted to. 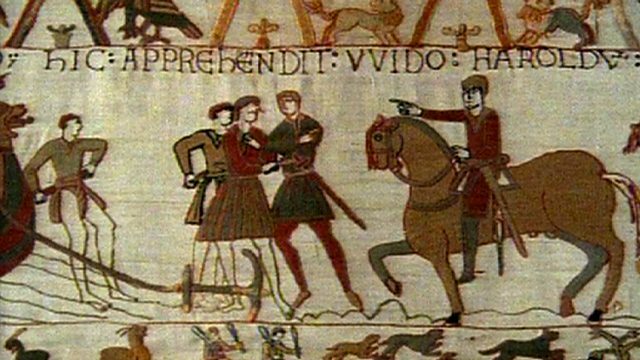 1066 is the best-known date in English history. or think we know about the event, is captured in the Bayeux Tapestry. is that it's not a tapestry at all. Technically, it's an embroidery. A tapestry is woven on the loom. An embroidery is stitched onto the fabric - in this case, linen. men going like that, going overseas and meeting kings. in terms of its proportions. That's only half of it, way down there. It's displayed on a U-bend on the outside of it, here in its gallery. which was top nation at tapestry making at the time. Normans by their hair, cropped aggressively short at the back. The more you look at the tapestry, the more sophisticated it appears. Harold is here shown eating a meal before sailing to France. He and his companions are on the first floor of a large house. the upper floor is also the meal table. who is now seen boarding his ship to Normandy. Where necessary, scenes are separated by highly stylised trees. and have sometimes been dismissed as mistakes. than is the use of flashback in a novel or a feature film. can point to Edward, bequeathing him the kingdom just before his death. is that Harold was killed with an arrow in his eye. Is the tapestry the original source of that story? It's the earliest known source of the story, but it's a very plausible one. because so many arrows were flying around. obviously dead. THAT could be Harold. draw your figure several times, in order to show the change. Series supporting Primary Art and Design. Mark Speight paints in Monet's garden, Rolf Harris reproduces a still life in Cezanne's studio and, filmed in 1957, LS Lowry describes his unique way of painting. Also looks at the history and details of the Bayeux Tapestry.